I have been in the drama business for quite a few years. I coach it for students in my school, I have seen my own daughters involved in it and I write drama pieces as well. I know how hard it is to break in. I’ve seen my daughters through a lot of action, so far. I remember well the time Stefanie piled her then-blond hair up in a bouncy pony-tail and played the wide-eyed, original ditzy girl in a community play. It was one of my favorite performances and it was hysterical because that was so not her, so it meant she could act. I remember Tracie’s first part which required her to simply drop a pail and look astonished. 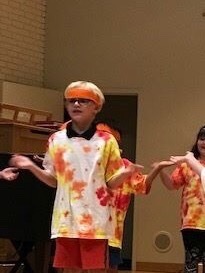 I remember thinking, “Well, was it just me, or was she pretty good at that?” It wasn’t just me…the next thing I knew my little bucket-dropper had the lead in the Christmas pageant. I’ve been through many enjoyable performances since then. I wasn’t aware, however, that the family performance tradition might take in another generation. My two grandsons had begun the rite of passage of singing in school programs before I knew it and I was missing them, one after another. Of, of course I got to see video of it, but neither boy looked like they had a future on the stage. The older one looked unenthused and the younger one appeared to be fairly hostile. That was, until this summer. 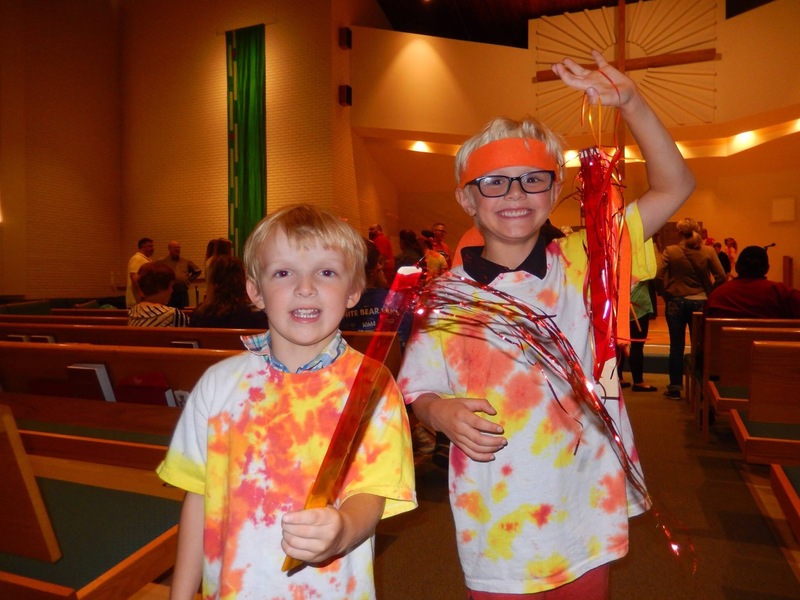 By some miracle of scheduling, I was able to see my grandsons for the first time in their program…an end-of-vacation-Bible school extravaganza, complete with wild, tie-dyed shirts and orange and yellow headbands. I was elated. The younger one was going to be doing some singing and actions and the older one was going to speak! Some of the older students had the main parts in the Biblical story of Daniel and the three faithful who were tossed in the furnace. The part of King Nebuchadnezzar was played by a feisty young lady with a real feel for the dramatic flair (take it from an old drama coach). But I was excited for my grandson, Royce’s part. He came out and danced and went through the actions and words of the songs, which went very well. I got loads of pictures, fighting all the other parents and grandparents to get just the right shot. I even got some shots of my younger grandson, less hostile than normal, as he, too, joined in the singing. “Here comes his part,” I whispered to my husband, excitedly. “What part is he playing?” asked the proud Mama snapping pictures of her little ones beside me. “He is Speaker Number 12,” I announced proudly and just then, he stepped up and in ringing, clear tones pronounced his one line and then moved aside to allow Speaker Number 13 to speak. So now, I add to the memory of his mother as the ditzy blond and his aunt as the astonished bucket dropper, the memory of my little orange and yellow flame-covered thespian in the memorable role of “Speaker Number 12.” You don’t think it’s too soon to book my tickets for his Broadway debut, do you?